New York: Even as everyone can make out the man in the earth-facing side of the moon, researchers, including an Indian-origin scientist, now believe that they have solved the mystery of why no "face" exists on the far side of the moon. 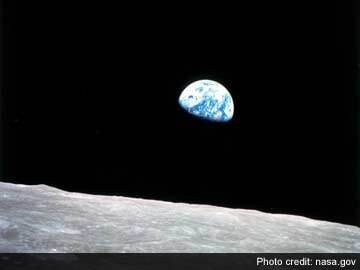 The absence of maria - large flat seas of basalt that we see as dark which is due to a difference in crustal thickness between the side of the moon we see and the hidden side - is a consequence of how the moon originally formed, a new study revealed. According to Arpita Roy from Pennsylvania State University "When meteoroids struck the far side of the moon, in most cases the crust was too thick and no magmatic basalt welled up, creating the dark side of the moon with valleys, craters and highlands but almost no maria". The mystery of why no "face" exists on the far side of the moon is called the Lunar Farside Highlands Problem and dates back to 1959 when Soviet spacecraft Luna 3 transmitted the first images of the "dark" side of the moon back to earth. It was called the dark side because it was unknown, not because sunlight does not reach it. Researchers immediately noticed that fewer "seas" or maria existed on this portion of the moon that always faces away from the earth. Earlier in its history, large meteoroids struck the near side of the moon and punched through the crust, releasing the vast lakes of basaltic lava that formed the near side maria that make up the man on the moon, the study noted. The findings appeared in Astrophysical Journal Letters.